One of the most beautiful Noucentista buildings in Barcelona, the Estació de França is worth a look even if you aren't going anywhere. It was erected in 1929 for the International Exhibition and inaugurated by King Alfonso XIII. 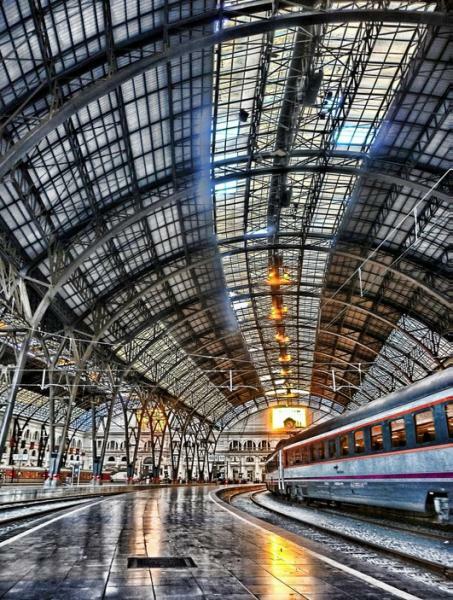 Unlike most rail stations, it was built on a curve in the tracks, lending the iron structure an unusually sensuous beauty. Although the Estació de Sants now gets most of the trains, this station was attractively revamped in 1992 although in 2017 it may well lose its status as Barcelona's second busiest to the Estació de la Sagrera when the TGV linking Barcelona to France is open. It will maintain its current service up the Costa Brava; it's also on the suburban Rodalies lines. Part of the old station now houses a section of the Pompeu Fabra University.